hi, if you are using SPI, why you connect SDA and SLC pin ? I have no idea why they labeled the outermost pin as SDA. 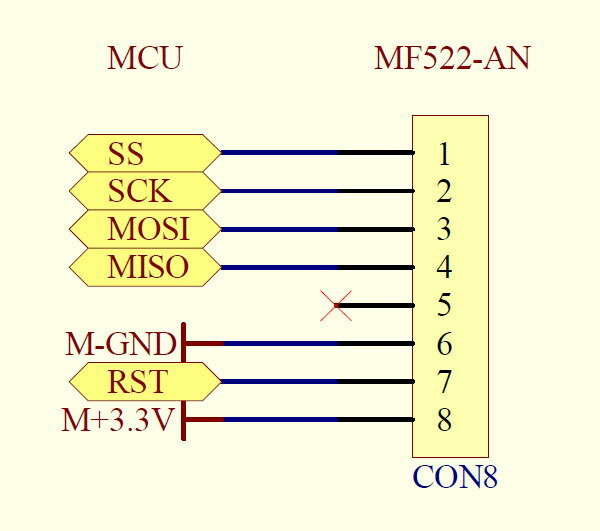 See http://s4.electrodragon.com/wp-content/uploads/2012/03/MF522-AN-5.jpg for better pinout description. There’s no SLC pin, you probably misread SCK for SLC. It was the only fully working TUT and Code that worked for me. ive written a script which toggles an led. normal shell run: all normal. i still have a question, what pin you connect for SDA n SCK on RSPI pin ? i hope, i can help you a bit. This hardware setup works fine for me. that’s great ! thank you..
missing/different environment variables, for example PATH might not have the same value as it was when you tried to execute it from your shell. If your shell script uses external binaries that are referenced with relative paths these might fail. Try to replace all the paths in your shell with absolute paths. Is your normal shell the same as /bin/sh and does your script work with it? iam normally using bash… and with your command given it does nothing except empty lines with “>”. no output…. and is there a way to export the read serial? so that i use this programm just for reading? You probably forgot to terminate the single quotes around the script name. As to reading new serials there’s no good direct support but following hacks should work. If you don’t describe any known serials in the configuration file and run the program in the debug mode it will print all the read serials into it’s output which you can read with other programs. Another method would be to execute the reading program from your python script using subprocess.Popen() and read its output that way. I don’t have the rc522 reader at hand anymore so none of this was actually tested. I took a another look at the code of the library and I believe the reason why it doesn’t work with your script is that the rc522 reader binary drops root privileges to the UID given in the configuration file after doing the hardware initialization. While this is good practice from the security perspective it also means your script isn’t called in the root privileges anymore. Accessing file /root/status.txt in your script and using RPi.GPIO module both probably require root access and will fail because of that. The methods with piping that I described in my previous comment should still work though. i want to use your last suggestion. killing the reading subprocess after each read tag doesn’t make much sense. I suggest you let it run and do your stuff when the new tag is read. Here’s a simple wrapper class that you can use for example. You have to make a tiny modification to the main.c of the rc522 library and recompile it. This is just a way to get around the output buffering when using pipes. Otherwise python process wont see the serials until output buffer of the rfid_reader process is filled. but i want to check for every new read serial, if this serial is in the text file. with my code it works 1 time. no more. But how can i read multiple serials an then print e.g. the names after the serials from the .txt? It’s defined as a class member. Remove the indentation before it so that it would be just a top level function. ah… i oversaw it ..
well sys.argv is a list of command line arguments and sys.argv is argument number 1. In your case you probably want to define a variable containing your file name and use that as an argument instead. but it does not yet do, what i intend ..
i want tu print only this name, which belongs to the serial wich is read. maybe check everytime if the serial is in the file and then print just this line? # blink the lights etc. print(“a”, b) prints out a tuple that consists of 2 elements: string a and variable b.
print(“a”, b) wouldn’t print the extra parentheses there because it would be just a call to the function print with 2 arguments. the expression print(“a %s” % str(b)) should work in both python2 and python3 because in that case python2 will see it as a keyword print that is followed by string that is surronded by useless parenthesis and python3 will think of it as a function call. I want to publish my whole code on the internet. Write a log file ? in general the collision happens when the reader sees multiple tags at once (for example when you wave your wallet at it that contains multiple rfid cards). in the normal mode it’s meant to execute commands defined in the configuration file for the cards that are defined there. I’m trying to configure this for a school project, and I was wondering if you have an example of what the code would look like in the /etc/RC522.conf file for the IDs of the cards. I have some experience with programming, but not an extensive knowledge. I’ve looked at a few examples on the web, but I am still unclear as to how to proceed. Also do the ID cards have to be saved in the RC522.conf file to stop them from going to the /tmp/? Obviously this is not how it would actually look, just kind of what I think the logic behind it would be. Any help is definitely appreciated. If you don’t want to be memory dumps of unknown cards to be saved under /tmp you can just remove the NEW_TAG_PATH option from the configuration. I was wondering if you could help me. I am new to this so this question may sound simple. I will be using a dual relay (5V DC Two 2 Channel Relay Module ) to activate a small solenoid. The problem i have is i need the activation of the RFID to set one of the RPi’s GPIO pins to low to activate the relay. I am hoping you might be able to point me in the right direction as i have no clue what to do next. I am also new to code. There are many ways of doing this, one would be the approach that uses unix pipes that we discussed with Florian in this comment thread earlier. What I would suggest instead is to write a simple HTTP service that can turn the light on or off based on the request URI. Then you can easily call it from the configuration of the rc522 utility by using wget command against specific URL on your server (which might run on the same or different machine). I originally tested the library with this simple python script that runs a standalone webserver on port 8080 and plays different sounds when different URLs are accessed. You can use it as a basis and just replace sound playing with pin toggling. Thanks for the info Hadara, im assuming it was for me. Unfortunately i didnt understand most of what you said, i am an ultra newby at this and as yet have no clue what im doing. If you could possibly explain it like your talking to an idiot ( that would be me) i would really appreciate it. If you dont have the time thats ok also. I am looking at the RC522.conf file now in leafpad and not sure if its the right file. also is it just the number of the keyfob or card that i use. Florian, i tried your software above but am having issues. I tried the Text file one first, but got the following Syntax error. I couldn’t try the SQL one, because I need better instructions as to how to set up the database. On another note, I couldn’t get the basic RC522.conf file to execute commands. When i scan my cards in debug mode, I get the following.. But no command is ever executed? Any help would be greatly appreciated. Thank you so much hadara, for making this, and to Florian for posting his pictures. I am using the Raspberry Pi Rev. 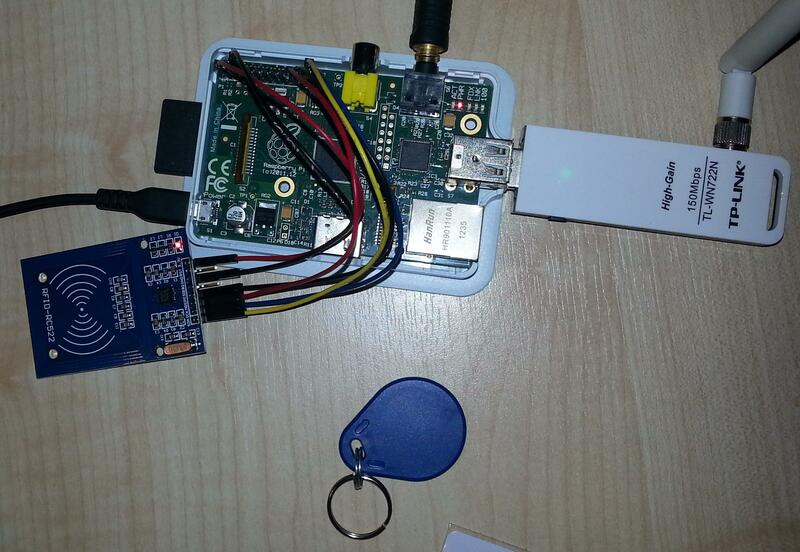 2, and the Sunfounder RFID-RC522. I was doing Y , enter key, and it would abort, so I tried just hitting the enter key, no y, and it worked. work perfect with nfc chip but nothing appears with rfid chip or card…. why? Hi, I am also facing the same problem which David has mentioned. I am getting multiple collisions in the output. I have checked my wiring and connections but everything is fine. Also, there is only ONE RFID tag around. But no command is ever executed? Hi , thanks you a lot for this simply procedure to use this technology. I’ve installed all , no problem , i use this to open gate . But i’ve seen that after a time .. 1 day 6 h or 12 h , script stop working .. but when i reboot or reopen script system work normally … you have some idea ? can you help me, how about to save ID of Tag to SQL database with java, please reply this comment to my email tajudinsubki@gmail.com. After for new kernel we must cut user root control to escape from many command issue , for example my command has gip control that not work as guest ! kannst du das nochmal auf deutsch schreiben. solve your issue “after a time .. 1 day 6 h or 12 h , script stop working”? rc522 is working great, but to push something to the db from the python script you first need to setup corresponded mysql database with the tables given… it would be nice if you could release the db-import file for creating such tables trough the python script you guys provided. I`ve made the database scheme. I also upload it at my sourceforge page. has anyone tested this setup with a raspi v2 ? I used it with the b+ and it works fine but my raspV2-Setup makes problems. Maybe I got wiring problems but maybe, you know any software-problems ?